Following the Paris terrorist attacks, there will be countless analysis of the facts and figures. What should we do and how do we stop these terrorist acts from occurring? Some people will argue for higher military spending or looser gun laws. Others such as Australian AG George Brandis will use the acts as a cover to curtail our civil liberties. Some will go on racist tirades (the ‘Bolt’s comments’ twitter page is a good example), while others will extend an olive branch with twitter hashtags such as #illridewithyou. The one conclusion that can be reached, however, is that the War on Terror has been a catastrophic failure. Rather than stopping terrorism, the war has, in fact, intensified it. The number of terrorist incidents is actually higher than it was at the time of September 11. The graph below, sourced from the Institute of Economics & Peace, illustrates that failure. Prior to the war on Iraq, terrorism was largely irrelevant within the Middle East. 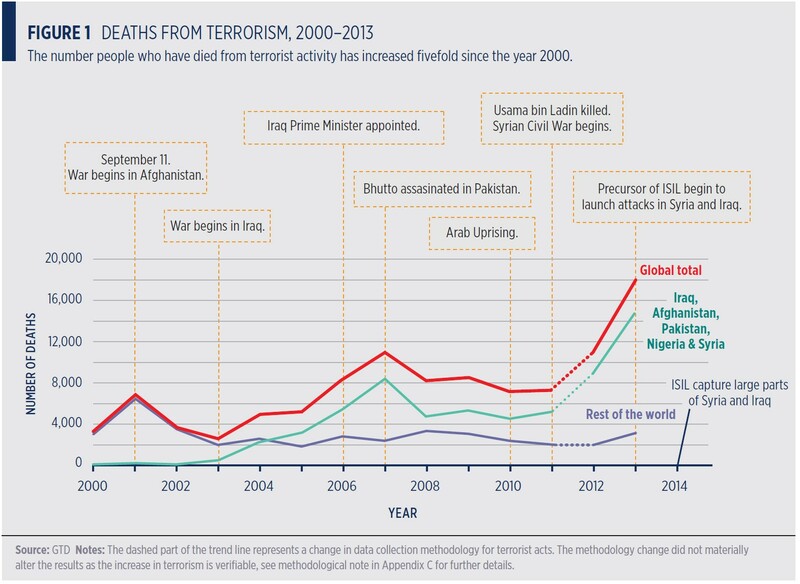 In 2013, there were some 10,000 terrorist incidents resulting in around 18,000 deaths. A vast majority of those deaths occur in just five countries: Iraq, Afghanistan, Pakistan, Nigeria and Syria. In Iraq, 6,362 died from terrorist attacks in 2013 (35.4 per cent of total deaths). A further 14,947 people were injured. The west may not be willing to accept this but we must share some of the blame. There was always going to be a military response following such an unprecedented attack on the United States. But nobody forced us to bungle the military response as we did; certainly nobody forced us to invade Iraq. That the war on Iraq was justified on incorrect information and was largely a vanity project for the worst US president since Nixon, makes the failure only more terrible. It still remains unclear why we went to war against Afghanistan and Iraq rather than the terrorists themselves: I assume it was because we were too lazy or it was too difficult to identify the real enemy? Nevertheless, that’s exactly what we did. We let inadequate politicians and career sociopaths civil servants lead us into an unwinnable war that resulted in tens of thousands losing their lives. The more disturbing fact – assuming that anything is more disturbing that the most powerful leader in the world deriving an imaginary way to invade another country – is that we have yet to see the full implications of that war. There’s a very real possibility that the worst is yet to come. Consider for example the fact that terrorist organisations such as al Qaeda were formed in the aftermath of the Afghan-Russian war during the 1980s. Operatives within al Qaeda (and other organisations) tested their metal against a largely unmotivated and bankrupt army that was on its last legs. The war on Iraq, by comparison, encouraged people to come to Iraq to fight the might of the United States and her western allies. These soldiers tested themselves against the most capable and best trained military in the history of the world. This is the environment that will give birth to the next generation of terrorist organisations; they will be better trained and resourced that the likes of al Qaeda and for that matter ISIL. The question remains: how do we defeat terrorism? And the reality is that you don’t. You cannot defeat an idea, not really, but you can undermine its legitimacy. The war on terror won’t be won by better soldiers or naval and air superiority. This isn’t Germany and the Nazis; it’s not even Vietnam; this is a new type of war that requires new strategies that take advantage of the weaknesses of the enemy while enhancing our inherent strengths. The war certainly won’t be won by creating scapegoats such as Afghanistan and Iraq; terrorists are not countries and shouldn’t be treated as such. They are a group of loosely connected individuals with similar shared beliefs; the ideas cross country borders as easily as support for Manchester United. We cannot be bound by limited state vs state relations. So what’s the solution? What can we do if our guns and bombs won’t work? Terrorism is at its core a battle of ideas. As a result, the war on terror will be won through public relations. The west needs to prove that freedom and democracy is every bit as good as we tell the Middle East it is. We need to ensure that terrorist organisations appear as extreme within the Middle East as they do outside it. Unfortunately, winning the PR war is awfully difficult when you are also invading these countries and bombing innocent civilians. It becomes harder still when social media makes it more difficult to hide the facts from the public. Obviously there is more to it than that. Cross-border cooperation among security agencies is key; undermining resources and cash flows is paramount and arresting and interrogating known terrorists and their associates is necessary. But ideas are ultimately beaten by better ideas. Communism wasn’t beaten by nuclear weapons but by the superiority of capitalism. The belief system of al Qaeda and ISIL will not be beaten by drones and bombs but by the eventual realisation that freedom and democracy is the best political system yet derived. Two final points worth emphasising: we need to put the threat into perspective and we need to remember that Islamic terrorists make up only a small share of the broader religion. Unless you live in Iraq, Afghanistan, Pakistan, Nigeria or Syria, the threat from terrorism is so incredibly small that it would be irrational to let it impact your daily lives. In the aftermath of Paris that might be difficult to believe but as always statistics can offer some perspective. For example, Australians are more likely to die from falling out of their bed than they are from terrorism. In American, drowning in your own toilet remains a greater threat that dying from a terrorist attack. Finally, it is easy to rail against the Islamic faith but the reality is that extremists are exactly that: extreme. Every religion has them; in America some Christians like to bomb abortion clinics for example. Is it stupid? Sure but any group that is sufficiently large (and the Muslim community is estimated at around 1.5 billion people) will have members who are capable of extreme violence.